Looking for design books? Biblio.co.nz hosts hundreds of of the finest online book stores and booksellers, including specialists in design. Use the list below to locate a specific specialist bookseller or book store near you. 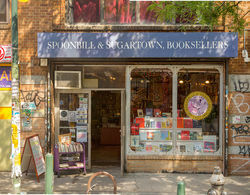 Or, use the form below to search the inventory of all booksellers who specialize in design. books. used, out-of-print. specialties in art history, design, architecture. books in many subject areas. selling on-line and by appointment. I specialize in books related to 20th century design. This includes Art Nouveau, Art Deco and 50\'s through today. Areas included are furniture,glass, ceramics, metalwork, graphic art, industrial design, jewelry, silver, etc. Specialist Booksellers. Art Reference, Catalogue Raisonne, Exhibition Catalogues. Particularly well stocked on British Art. Along with a small carefully selected collection of Artists Books. Visitors are welcome, but it is best to telephone in advance. Concept Books is an internet bookseller specialized in 20th century books on literature, art, design, typography, architecture and photography. We buy special and rare books on these subjects. Please visit our showroom at: http://goo.gl/oZxTq. The occasional book I want to sell from my private collection. I specialize in architecture and design books - with a few transport and others I've come across thrown in for good measure - anything I've found interesting I suppose! Libro Co. Italia is a Company specialising in the research and sale of books on art and architecture in ltaly and abroad. With more than 800,000 specialised book titles available on our database including rare books, bank publications, art and architecture publications, exhibition catalogues, archaeological, photographic and cinema titles. UPI 2M BOOKS is bookstore and publisher dedicated to architecture, civil engineering, art and design. Simon Finch has been a Rare Book Dealer since 1980. He has had shops in Notting Hill Gate, Mayfair and Holt, Norfolk. His firm has handled a wide variety of material from the First Folio of Shakespeare to the wilder shores of the counterculture and everything in between. In 1998, Simon bought Voewood, one of the finest Arts and Crafts and houses and brought it back to life with an eight-year programme of renovation and restoration. 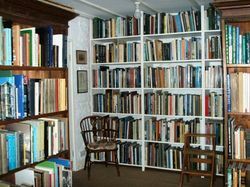 Voewood Rare Books, which operates from Voewood, is the continuation for Simon of a long career in the book trade. It also represents an important link with the House. Voewood is always beautiful, surprising, mysterious and perhaps a little disorientating and we aim to bring something of this spirit to the bookshop. Whilst our focus in on the visual arts, literature and the counter-culture, we deal also in a broad range of antiquarian and modern rare books across all subject areas. Our collection can be found here at Biblio and on our website. We are open by appointment and can always be contacted by email.